Central banks around the world, including in Europe, are buying increasing volumes of equities as part of diversification by official asset holders that are now a global force on international capital markets. 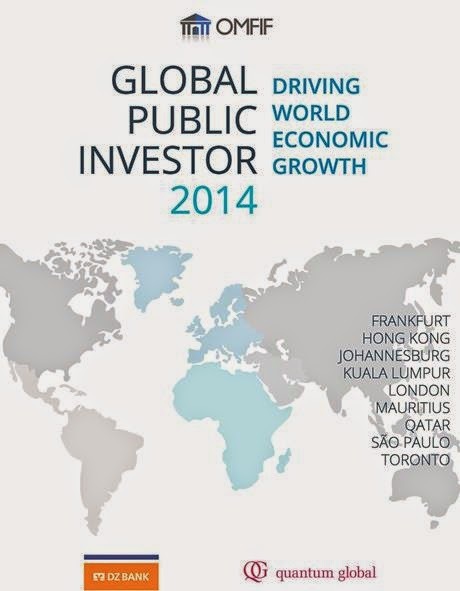 This is among the findings of Global Public Investor (GPI) 2014, the first comprehensive survey of $29.1 trillion (tn) worth of investments held by 400 public sector institutions in 162 countries. The report, focusing on investments by 157 central banks, 156 public pension funds and 87 sovereign funds, underlines growing similarities among different categories of public entities owning assets equivalent to 40% of world output. It is published by the Official Monetary and Financial Institutions Forum (OMFIF), a global research and advisory group, with the support of DZ BANK and Quantum Global Group. The assets of the overall survey of 400 GPIs comprise $13.2tn (including gold) at central banks, $9.4tn at public pension funds and $6.5tn at sovereign wealth funds. One of the reasons for the move into equities reflects central banks’ efforts to compensate for lost revenue on their reserves, caused by sharp falls in interest rates driven by official institutions’ own efforts to repair the financial crisis. According to OMFIF calculations, based partly on extrapolations from published central bank data, central banks around the world have foregone $200bn to $250bn in interest income as a result of the fall in bond yields in recent years. This has been partly offset by reduced payments of interest on the liabilities side of their balance sheets. GPIs as a whole appear to have built up their investments in publicly-quoted equities by at least $1tn in recent years. The publication outlines investment by organisations as diverse as the People’s Bank of China and State Administration of Foreign Exchange (SAFE), Japan’s Government Pension Investment Fund (GPIF), Swiss National Bank, Norges Bank Investment Management (NBIM), China Investment Corporation (CIC) and Californian Public Employees Retirement System (CalPERS). It includes, too, Bank of Korea, Malaysia’s Khazanah Nasional, Public Investment Corporation (PIC) of South Africa, Temasek of Singapore, Australian Government Future Fund, New Zealand Superannuation Fund, Canadian Pension Plan Investment Board (CPPIB) and Ontario Teachers’ Pension Plan (OTPP). The financial centres of Frankfurt, Hong Kong, Kuala Lumpur, London, Johannesburg, Mauritius, Qatar, São Paulo and Toronto are supporting the study. The report coincides with the opening in London of the secretariat of the International Forum of Sovereign Wealth Funds (IFSWF), previously headquartered at the International Monetary Fund in Washington. The report will be launched at City Hall in London on 17 June, as well as in other cities including Hong Kong on 17 July, Toronto on 16 September and in Washington on 22 September. The study recommends broad categories of public investors should adopt the IFSWF-administered Santiago Principles on transparency and accountability. It outlines suggestions on how to channel large-scale long-term funds into investment areas like infrastructure, energy and transport around the world, emphasising the need for co-investment, partnership and knowledge-sharing among diverse investment organisations from the public and private sectors. In the field of corporate governance and responsible equity ownership, the report recommends public investors should step up engagement with private sector shareholders to ensure appropriate stewardship. The study contains articles on GPIs by 64 authors from 56 institutions in 32 countries. Among the highlights are contributions from Tarek Al-Wazir, Hessen minister of economics; Franco Bassanini, chairman of Cassa depositi e prestiti; David Cameron, British prime minister; Heung Sik Choo, chief investment officer, Korea Investment Corporation; Jingdong Hua, Vice President and Treasurer, International Finance Corporation; Boris Johnson, mayor of London; Thomas Jordan, President and Chairman, Swiss National Bank; Jin Liqun, honorary chairman, International Forum of Sovereign Wealth Funds; Elias Masilela, chief executive, Public Investment Corporation of South Africa; Azman Mokhtar, managing director, Khazanah Nasional; Linah Mohohlo, governor, Bank of Botswana; David Murray, inaugural Chairman, Australian Government Future Fund; Adrian Orr, Chief Executive Officer, New Zealand Superannuation Fund; Ipumbu Shiimi, governor, Bank of Namibia; José Filomeno de Sousa dos Santos, chairman of the board of directors, Angolan Sovereign Fund; Anselmo Teng, chairman, Autoridade Monetaria de Macau; Amando Tetangco Jnr., governor, Bangko Sentral ng Pilipinas; Edwin ‘Ted’ Truman, senior fellow, Peterson Institute for International Economics; Fiona Woolf, Lord mayor of London. The study highlights how a recession-induced decline in interest rates in the major reserve currencies – the dollar and the euro – has had a seriously negative effect on the profitability of reserve holdings by central banks, adding to the drive for diversification. Some central bankers fear the need for government finance to support their budgets may strain on their own independence.